The Scarsdale Education for Tomorrow identifies four areas of learning, one of which speaks to student dispositions and qualities of character. The counseling department joins other faculty members in helping our students develop these important attributes. 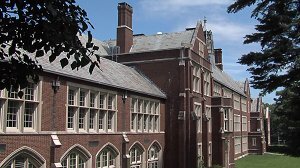 Counseling services at Scarsdale High School are designed to meet the educational, social, and emotional needs of students at each grade level. Students are assigned to a counselor (dean) upon entering the high school and remain with that counselor until graduation. This assures continuity of services and enables counselors to establish a personal relationship that best addresses the developmental needs of the students. A counselor is an advisor, a teacher, a listener, and a primary support person who works with students and parents, both separately and together, on developmental issues, course planning, college selection, and problem solving. Counselors respect the confidentiality of the relationship they form with students and their families. They seek to understand the expectations and concerns parents have and advise accordingly. Counselors and teachers work together closely to make the high school experience a rich and rewarding one for each student.